Using only the best quality New Zealand wool, these rugs were hand knotted in Pakistan in the tradition of Persian rug production. 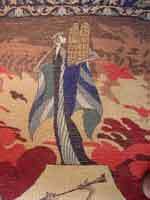 In order to get all the details of the artwork accurately, these rugs were knotted in a very high density of 256 knots per square inch. 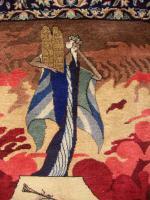 The center of the rug was reproduced from a serigraph or painting by Shlomo Katz, the colors of the ornamentation and borders surrounding Katz's art is designed by Mr. Adler to fit each and every image. 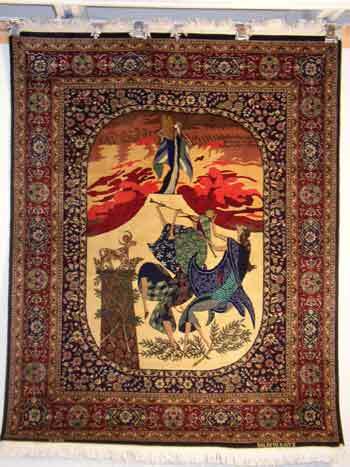 The average number of colors in a good quality Persian carpet is 18 - 20. 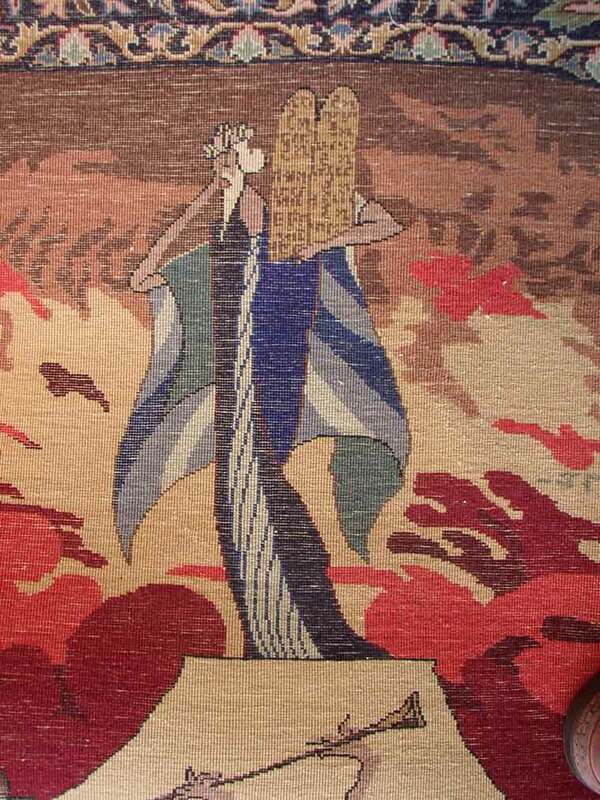 In the Katz rugs 40. 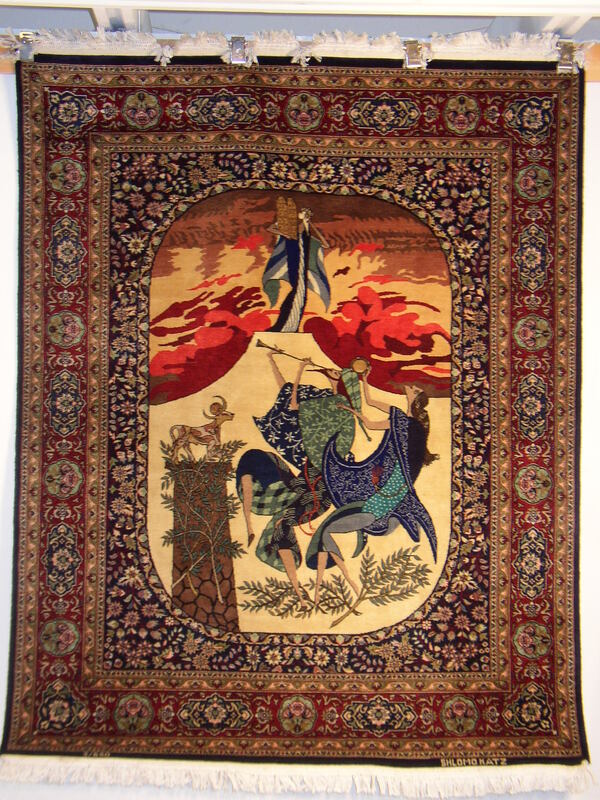 So far we incorporated into Persian rugs some images from the "Passover Portfolio" and some from "The Way of an Eagle in the Air," and all four images of the "Four Seasons" in one rug as shown in this website. These are in inventory or on backorder, but all images shown on this website may be ordered at the same price (per square footage), as well as larger sizes than shown. Production time for a new design, size of 10' x 8' is 18 to 24 months. Reorders take less time. of the front of the rug. This magnification is about double of actual detail in the rug. 5' 7" x 4' 6"
of the back of the rug. This magnification is about the same size of actual detail in the rug. Born in Lodz, Poland, Shlomo Katz immigrated to Palestine when he was just 8 years old. Educated in Kibbutz Mishmar Ha`emek, his talent for drawing was apparent from the very beginning. As a young man he went to Paris where he studied art at the Ecole de Beaux Arts. While numerous exhibitions in the US and Canada in the early 70s introduced his work of different periods, Katz developed an original technique of oil painting on a gilded metal surface. The result recalls medieval icons on the one hand, and oriental miniatures on the other. However, these ancient resources combine to form a totally modern image with a light humorous touch and a noble character. It took a lot of experimentation to translate these images to the graphic art form. The metallic inks of the golden tones and the importance of absolute registration presented just a part of the challenge, but the Katz serigraphs became the ultimate in modern printmaking. In 1985 Katz was commissioned by the Falcon Foundation to create 9 large paintings for permanent display at the chapel of the United States Air Force Academy in Colorado Springs, Colorado. These paintings are considered today a National Treasure and are the subject of a book of 120 pages. Shortly after returning from a 7 city exhibition tour in Japan, Shlomo Katz passed away in March of 1992.